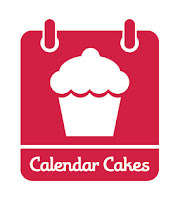 Please feel free to join us for July's challenge, which will be hosted by the lovely Laura from Laura Loves Cakes. On the very first day of the challenge we received these from Caroline at Caroline Makes. 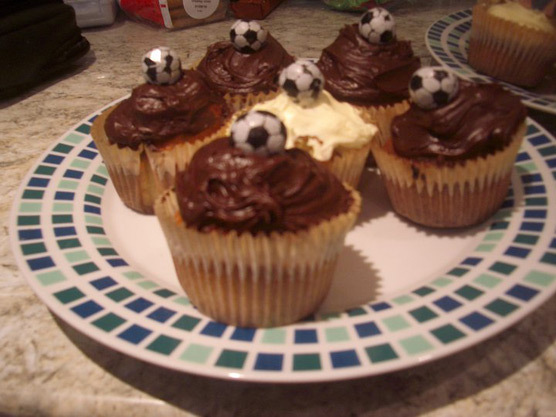 In 2011 she did some fundraising to rebuild a school in Namibia for the Bobby Moore Fund, and produced these little beauties in the process! Can you guess who make this one...? Self confessed bundt-o-holic, this one is mine. I'd been dying to use this tin for months! 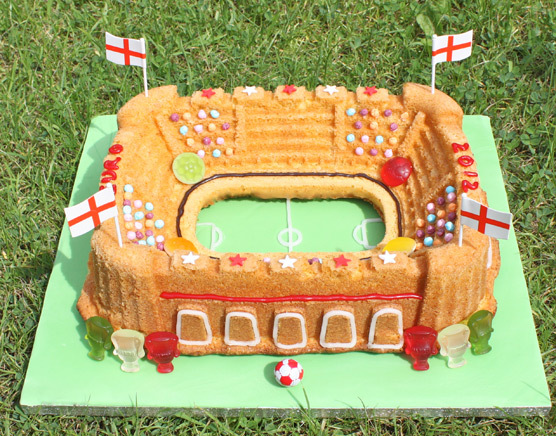 This was an orange flavoured bundt cake, with inspiration taken from the old tradition of orange segments at half time for the players. The next one is Laura's from Laura Loves Cakes. 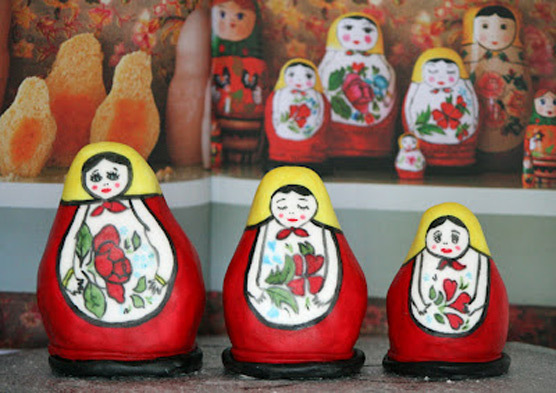 These are lime and vodka syrup Russian doll cakes. I adore them! Such intricate detail on their little faces. Stunning. 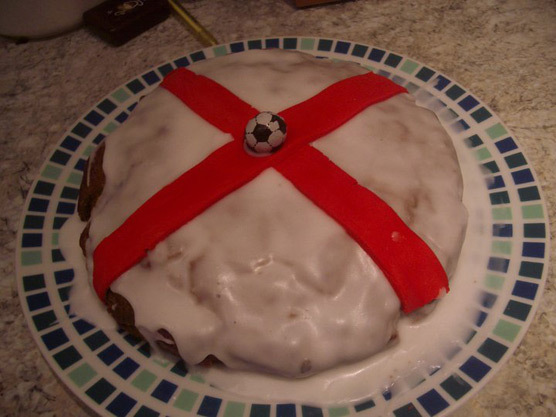 This patriotic little number comes from Kate at What Kate Baked. It's a strawberry and vanilla Victoria sponge. It looks amazing with the fresh fruit on top. That wouldn't last long in our house! 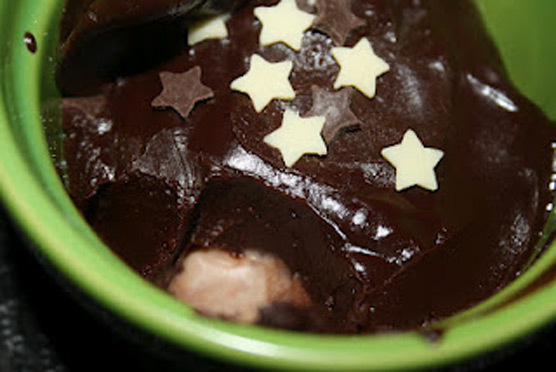 The next one is another entry from Caroline from Caroline Makes and is a French Valrhona chocolate fondant. I love this picture. It just catches the light glistening off the chocolate. Yum! 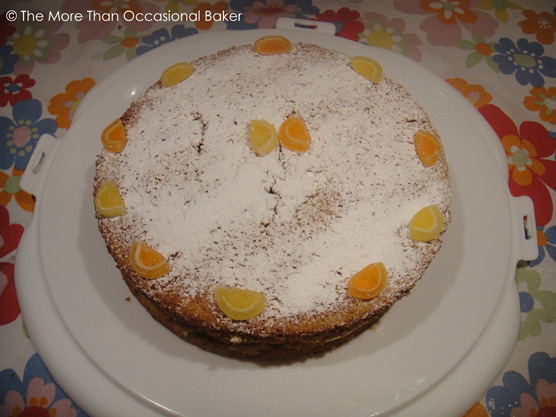 This one is a Spanish Valencia orange and lemon Victoria sponge by Ros at The More Than Occasional Baker. Lemon is my absolute favourite type of cake! This Russian Sandwich is from my good friend Dawn at Mummy's Little Peeps. I love the story behind this one! Dawn found the recipe in her grandma's hand-written recipe book and actually remembers eating it as a child. 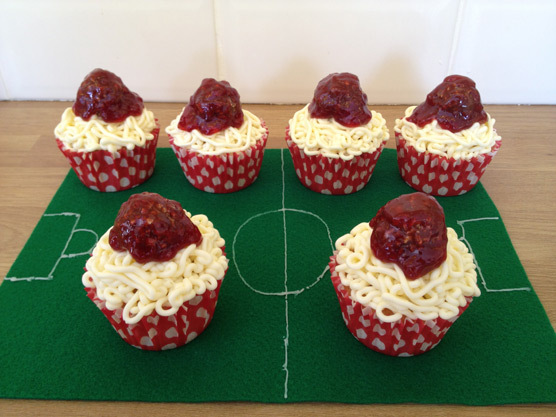 These meatball and spaghetti cupcakes from Cat Haslam are so much fun! She has used a vanilla cupcake and piped vanilla buttercream on to look like pasta. 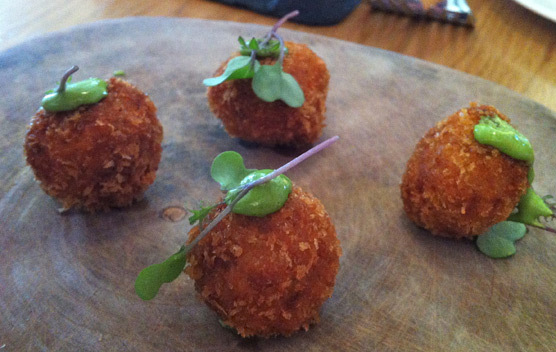 The 'meatballs' are actually Ferrero Rochers covered in a bit of strawberry jam. Very creative! Thanks to everyone who got involved for the month of June, we hope to see you all on the July one as well! Don't forget to tell your friends too, the more the merrier! So, the diet was going exceptionally well. Eating healthily with only one misdemeanour in the shape of a Tunnock's Caramel Wafer bar. That was until a chance encounter occurred this morning. My friend Emma and I were too late for a cup of tea in the staff canteen, so we went for a wander. It was then we saw it. A sandwich board which read 'Ma Simms Pie & Mash Shop'. Yes please! I nipped in to get a menu and a visit was arranged quick sharp. 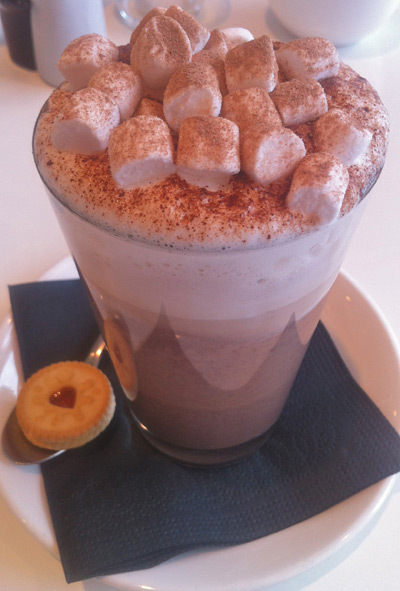 Ma Simms is the brainchild of the people who brought us Mr Simms sweet shop, and is situated in a quiet spot in St Andrew's Court, opposite the Crompton Place. I had to opt for local favourite, the Trotter Pork Pie. 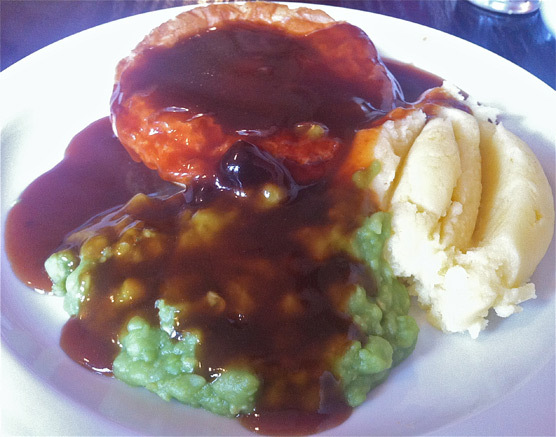 This came as part of a deal which included mash, mushy peas and gravy for a ridiculously cheap £3.95. My friends picked the Lamb Hot Pot Pie and the Steak and Kidney Pie. Portion sizes are huge! All pies are home made by the people who own the shop, the pastry is crisp with a buttery texture and fillings are generous. The sides weren't bad either. 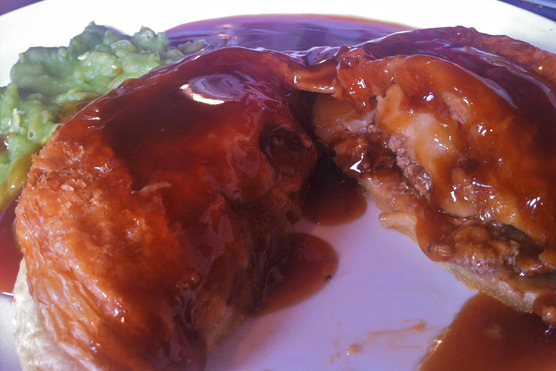 The mash is smooth and buttery and the gravy is packed with flavour. There really is no-where else like it nearby that I can think of. We were all really impressed with the quality of the food for the price they were charging. Special merit was given for the pastry, the big chunks of meat in the pies and for serving dandelion and burdock. Our only criticism was the length of time we had to wait. We were on our lunch break from work so only had an hour. We were told that they were busy when we arrived, but there were only two members of staff on to both cook and serve the food. One of our colleagues went later that day after we referred them, and was unable to get served within her lunch period for a take away. However, I think some of this was also down to the fact they take telephone orders for both takeaway and to eat in. I'll be doing this next time! The food itself is fantastic value and very tasty. It reminded us of the good old days when the Hen and Chicks' pie was a force to be reckoned with. I'm sure the issues with service are just teething problems, and this will ease as the staff get used to the flow of customers and the equipment they are working with. A very enjoyable lunch, followed by one of the worst PLLs* we have experienced. Ever. 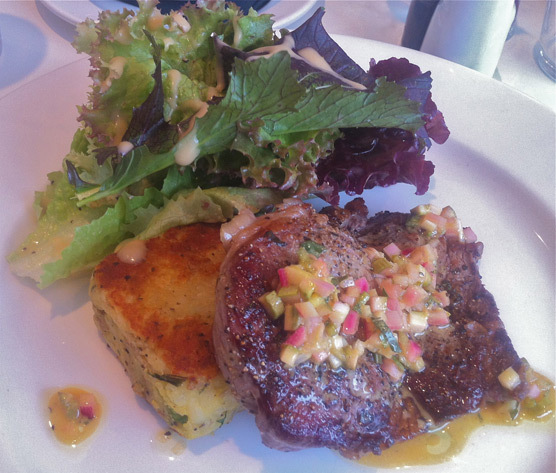 Food is very reasonably priced and the staff were friendly. We liked it here and will definitely be going back. e - a visit to the gym. That's right, I did not say tea shop and I didn't mention restaurant. The gym. Place of horror and misery. Do you see the progression I have made this afternoon? Having not set foot in a gym for over two years I decided it was prudent to do 'Legs, Bums and Tums' and then (in my infinite wisdom) I announced I was staying for 'Body Combat'. Two hours later I have arrived home looking like I have just been on the receiving end of a badly executed chemical face peel, a perm and with legs that are made of something of a similar structure to tagliatelle. If you follow me on Twitter, please expect much whiney behaviour tomorrow, as I'm sure my calf muscles are already half an inch shorter than they should be, and my face is stinging. Thursday: Simon Rimmer's turkey burgers with sweet potato fries. 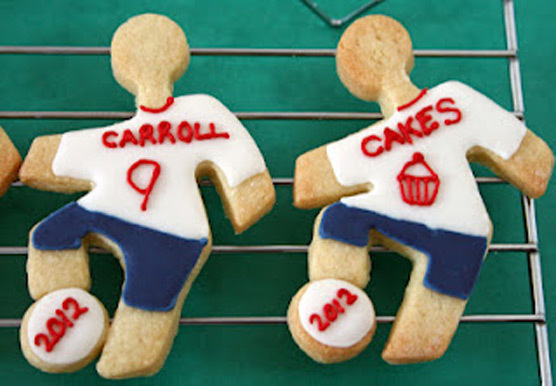 I learned how to make these when I went to his cookery demo on Saturday! Friday: Hehehehehe!!! Much excitement followed by a helping of eating out. We are Manchester bound! Saturday: I have no idea whatsoever. I'm being honest! Not sure what plans we have yet. 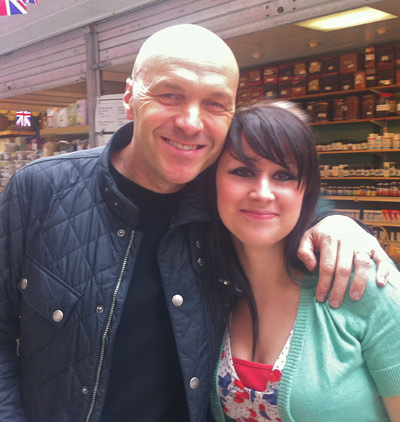 As part of yesterday's Love Your Local Market celebrations at Bolton Market, I was lucky enough to meet and interview Sunday Brunch's Simon Rimmer. 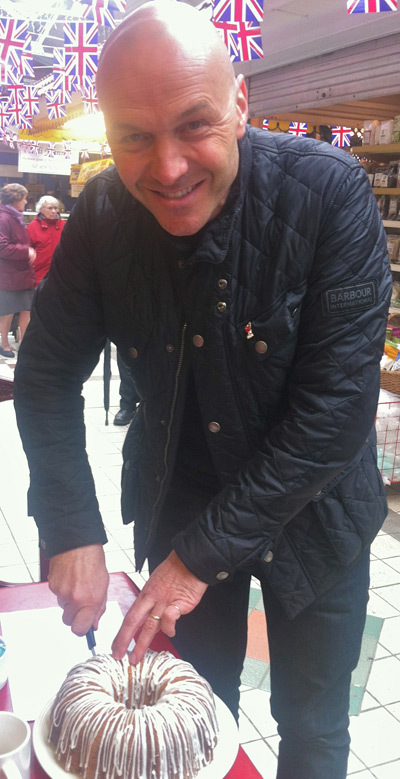 He had spent all morning meeting people, talking on BBC Radio Manchester and doing free cookery demos. He's is genuinely a really nice chap, and made time for everyone who came to see him. My apologies for the god-awful photo above, this is my 'smile on demand' face. I'm not as well practiced as Simon. After his second demo, he made time in his schedule for us to have a chat. Nothing was off limits, and he gave me some great local recommendations! 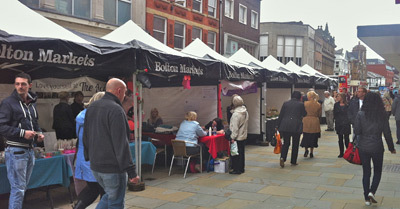 What do you think of Bolton's Love Your Local Market Event? I'm interested because I’m a massive advocate of local produce, regional produce, seasonal produce. I think it’s the way we should eat. I think we’re fortunate in the North West that we do have good markets; obviously we have Bolton, Ashton, Bury is nearby, Preston has a fantastic market too. I think we’re already doing what this event is all about. We have really good local markets, what we don’t have is a lot of people that are aware of them. I think people imagine that it’s the much older generation like your nan who shop here - and maybe that’s true! Maybe the best thing that could come out of this is the next generation of shoppers should be returning to markets rather than supermarkets! What’s your favourite local ingredient available here on Bolton Market? I think the best thing that we do in the North West that no-one does better is black pudding. 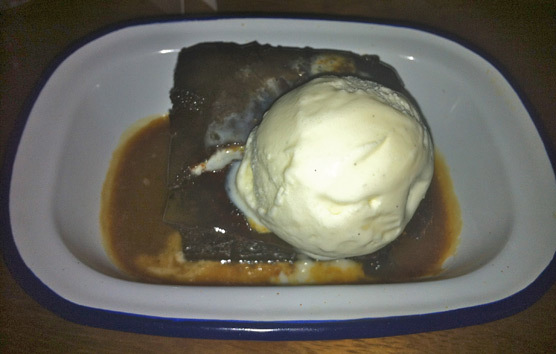 No-one betters us on black pud. Also in the North West we are tremendous cheese makers; we’re a dairy region. Lancashire cheese, Cheshire cheese, there are some amazing artisan cheese makers who make interesting and unusual cheeses, and goat’s cheeses are available now as well. Then of course we have tremendous asparagus which when it comes it such an exciting thing! We also have some great fish off the coast of Fleetwood; sea bass, cod off the Irish coast, great beef, great pork - statistically the North West has the most diverse agriculture in Western Europe. 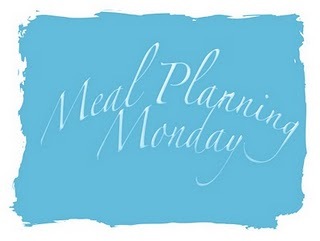 Other than your own, where are your favourite local restaurants? Places that I continually go back to are Sangam curry house in Didsbury, Sher Akbar in Chorlton, Sutton Hall in Macclesfield is a good pub and Sam’s and Thomas’ Chop House in town. Who are your favourite British chefs? Wow. In terms of people I find inspiring, whenever I watch Rick Stein, he makes me want to go in the kitchen. That’s the thing with him, he makes everything look so incredibly simple! He demystifies food. If I think about what I do on telly, that’s one of my big aims to make people think ‘I can do that’. That’s why I love Rick. The I think of Nathan Outlaw who used to work for Rick and now has a fantastic place down in Cornwall. Tom Kitchen, Tom Kerridge, Glynn Purnell for left of centre molecular gastronomy. Too many! I get excited by lots of British chefs! It was only three weeks ago! I ate in a restaurant called Azurmendi near Bilbao. It was the most incredible food I’ve ever eaten in my life. They’ve taken that modern, semi- molecular cuisine to a different level. Using loads of local and regional produce, just absolutely amazing. It’s worth spending the money to go to Bilbao just to eat there! In that case... your favourite cheese in the world? Ooh that’s always tricky! I have to go for Cheshire! After all these years in the industry, where do you find inspiration? I don’t think you ever stop being inspired. I was just saying today when I was wondering round that they guys on the fish stall have some tilapia. I’ve not had that on the menu for a while, so I think I can do something with that. I never ever stop being surprised. Like I said before, a few weeks ago I had the best meal of my life. 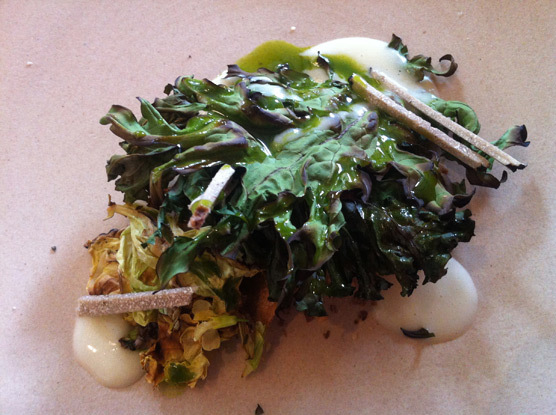 Last summer I was in California and I ate in a great restaurant called the Slanted Door. A bergamot and orange candy floss on the desert menu. Genius! Absolute genius! So you never know where you’re going to get inspiration from. If you could pass one recipe to your children, what would it be? Where is your favourite foodie holiday destination? California. Without a shadow of a doubt. They have tremendous restaurants and produce, a great variety of cultures. Britain does the most diverse food that you can get anywhere in the world, but as a destination San Francisco Farmer’s Market on a Saturday, (I excitedly tell Simon we are going there in September...) Oh you have to eat at the Slanted Door! 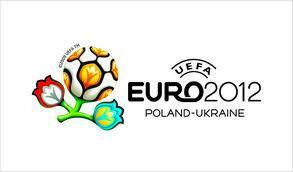 You need to book now! It’s brilliant! It’s Saturday so I’ll be in London with my nine year old son so I’ll be eating pulled pork in Bodean’s in Soho! Thanks to Jackie and Philippa at Bolton Market for being such enthusiastic wonderful ladies and to Simon for taking time out of his schedule to have a natter to me. From time to time I ask my Twitter pals for recommendations. They come back with all sorts of weird and wonderful places, both locally and further afield. I love a recommendation. Places where people I know have been and had such a good time, that they wanted to pass it on to other people. I'd been rabbitting on about The Rose Garden for a while, after my Twitter friend Helen had waxed lyrical about the chocolate tart she had eaten there. It was on the ever expanding list of things to do, places to go, food to eat. I may publish this list one day, but for now it's mainly in my head! Last week my husband booked us a table. We've both had a bit of 'a week' so we knew that a lovely treat was awaiting us on Saturday evening. We've spent quite some time perusing the menu, and we were pretty much decided before we even got there! It's about a 25 minute drive from Bolton, so not that out of our way. 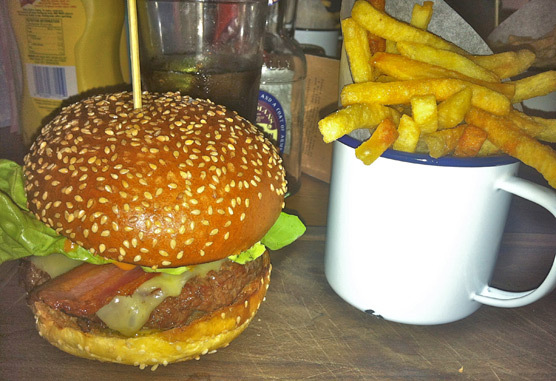 I've never been to Didsbury before, but first impressions were good! The restaurant is situated on Burton Road which seems to be a main high street. On the same road there are other trendy restaurants and bars, and cutie pie home shops and tea rooms. We are definitely going back when they are open! The Rose Garden wasn't open yet, so we had a drink in a bar called Folk opposite. It was the sort of place that we describe as 'different, but not too quirky'. Imagine the Northern Quarter in a village setting. They even serve cake. They get points for this. First impressions of The Rose Garden can be summed up in three words; 'excited belly ache'. The front of the restaurant is glass, which allows you to see the entire restaurant. It's minimalist with a homely touch. 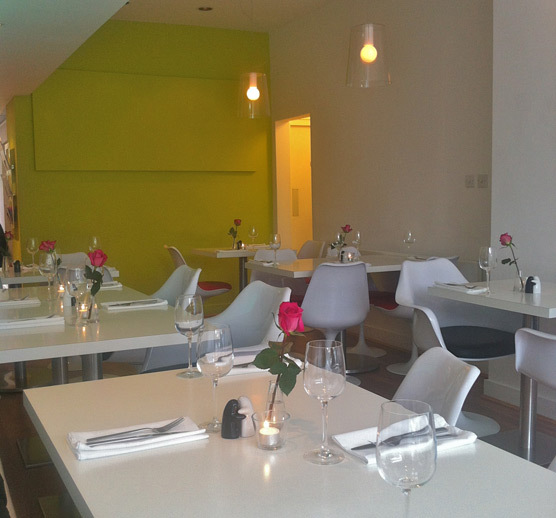 White walls and chairs are offset with fuchsia roses on the tables, a lime green feature wall and warm lighting. Hell, there's even a couple of polar bears on the wall. A very pretty place indeed! It's a family affair, with the chef's father designing the interior, his brother making it into a reality and his younger siblings serving tables. This business is cared for, and it shows. 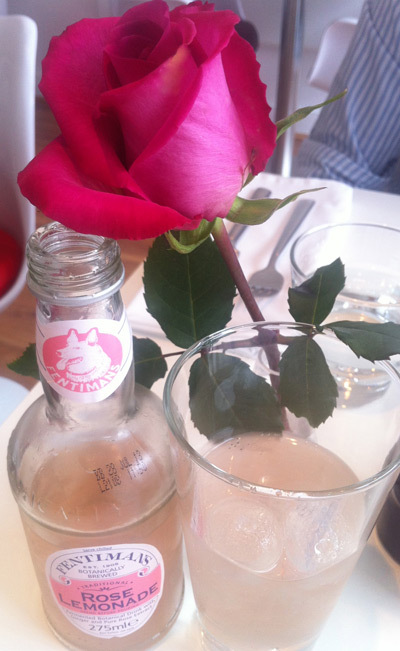 What better place to drink rose lemonade? This was lovely! It reminded me a little of gin, but with a cheeky little fizz! I would say that both of our starters were the best course by far. My husband said the sauce served with his scallops was as good as the (now legendary) parsley sauce from St John's. This makes it a sauce super-power! The scallops were small but a perfect portion size. I had the coronation chicken. Our waitress told us that it had been a special over the Jubilee weekend, and had been so popular they kept it. Do not underestimate how much I mean this next statement. This is one of the best dishes I have ever eaten. Anywhere. 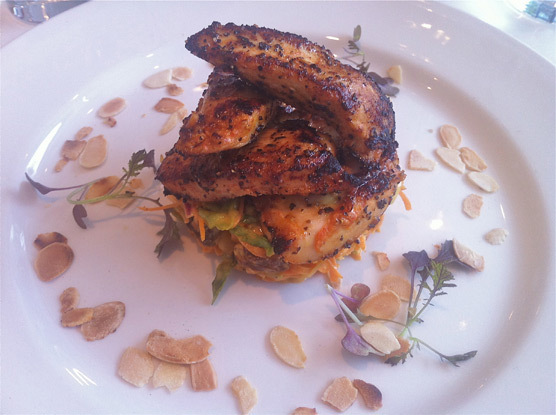 The flavour on the chicken, the texture of the charred edges, the spice and crunch of the coleslaw with plumped up sultanas and the sweet toasted almonds. This was a match made in heaven. I could eat this every day and never tire of it! If you go - have it. I insist. Praise indeed was sent to the chef. My husband had the two way guinea fowl, which came with game crisps. 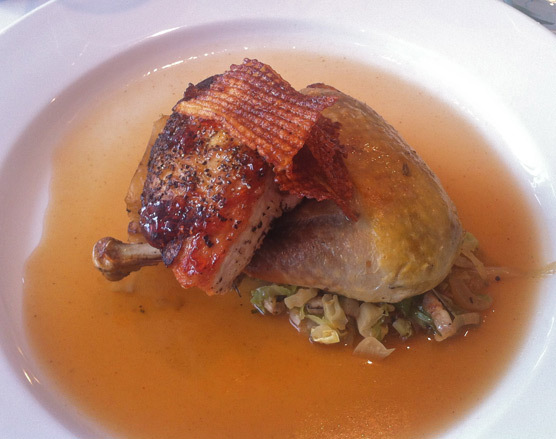 He was very impressed with the contrast between the aniseed infused confit leg and the rich glazed breast. A summer take on a gamey dish. He ate every scrap. I had the zesty ribeye. The meat was of superb quality, and cooked to perfection. It took very little effort to cut and was beautifully pink. The combination of the pea and spring onion hash brown with the salsa made this a very light dish. 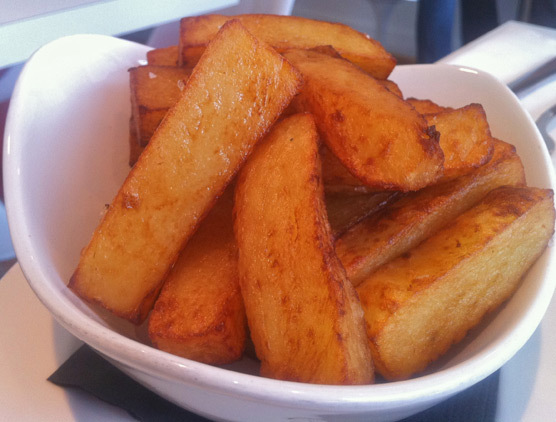 We couldn't resist a side of home made chips. These tasted just like the ones my grandma used to make in a chip pan when we were little. Packed with flavour with a soft, fluffy inside. At the end of our mains, our waitress asked if we would like to keep the chips we had left, and even offered to bring some Ketchup for dipping. Nice touch. 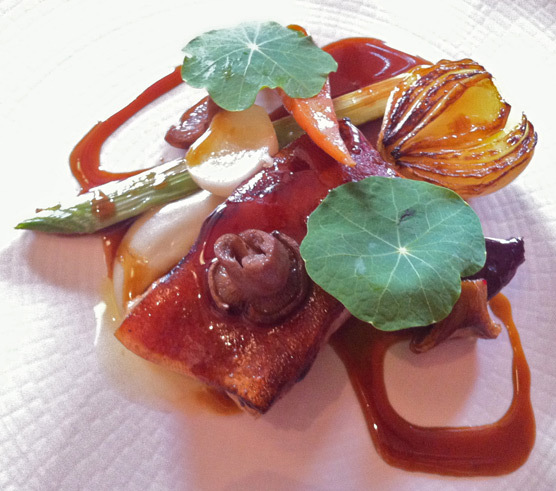 Although the restaurant feels suitably refined, the service is warm and friendly. 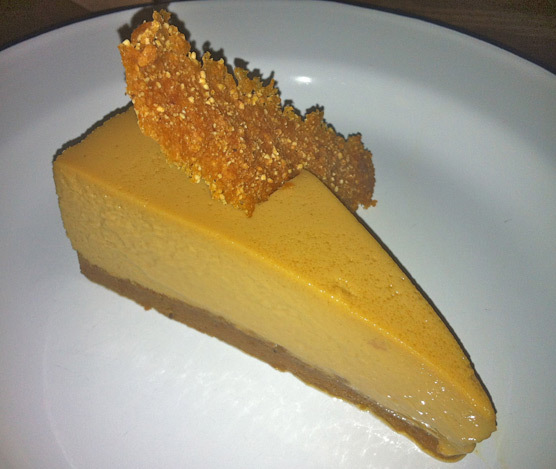 We had heard a lot about this dessert from Helen, so we had to try it. We shared both desserts as we couldn't decide what to pick. The filling in the tart is not firm as the picture may suggest, but light and almost like a moussy cake. 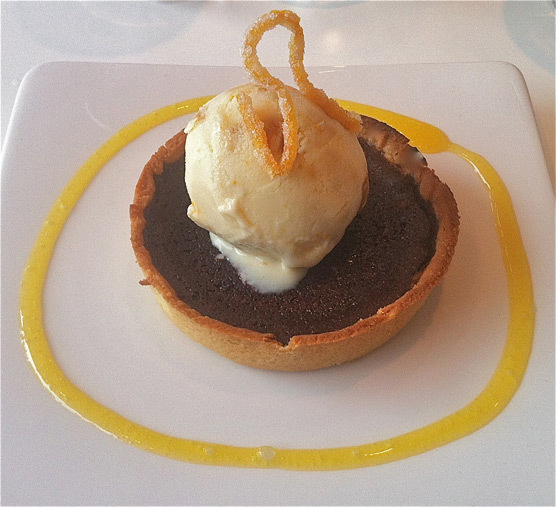 It was chocolate orange flavoured, and came with a citrus ice-cream. This was a perfect accompaniment to the rich tart. My only criticism of the dessert menu was that it was lacking something a little more fruity or cakey. 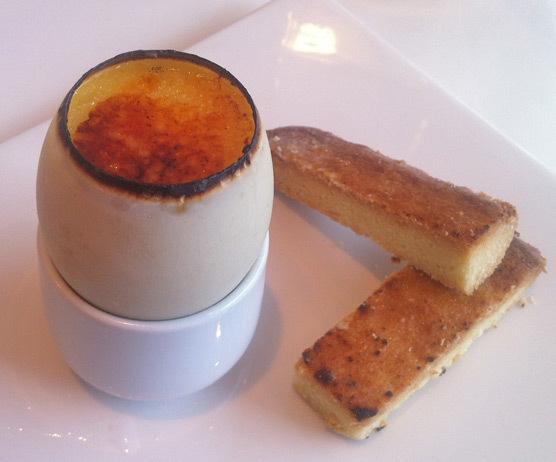 There was a rhubarb panna cotta, but this was similar in texture to the egg and soldiers. We were both suffering with a bit of post meal lethargy at this point so decided coffees were in order. 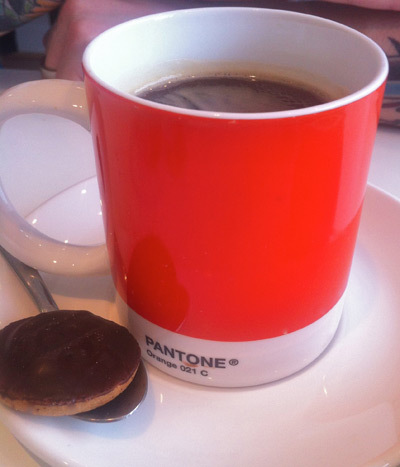 That was until I saw the hot chocolate and fancied that instead. This is the girl who moments before was dying from a suger overdose! Warrior-like behaviour... Our waitress explained that they had run out of whipped cream, but reassured me that she would foam some milk for me instead! It even came served with a wee jammy dodger. We will definitely be going back to The Rose Garden. We hadn't quite expected it to be as good as it was, so we were pleasantly surprised at both how nice the restaurant was and how well the food was cooked. I've been excited about this event for weeks. A chance for Bolton to showcase its wonderful market and for people to get involved; either as shoppers or traders. When I posted information about the event last week, there was a hive of activity on the post, Twitter and Facebook. 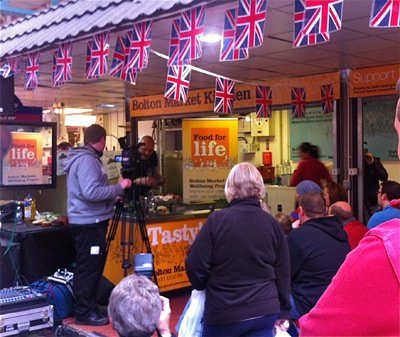 People all over the country were keen to know what Love Your Local Market fortnight was all about. So, in preparation I made a massive lemon drizzle bundt last night. I couldn't go under the guise of Dolly Bakes and go empty handed! The first thing on my 'to do' list was an interview with Becky Want from BBC Radio Manchester on her Retail Therapy show. 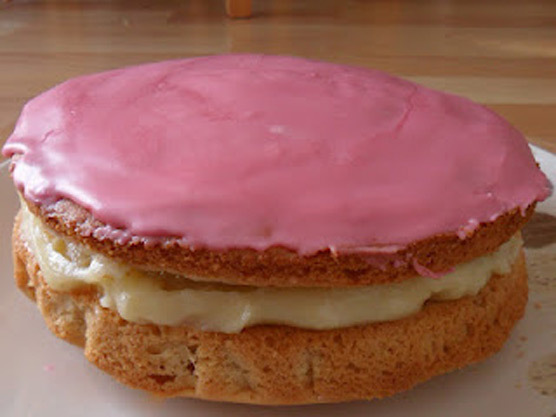 We chatted about Clandestine Cake Club, the cake I had brought with me and my blog in general. I then sat and listened to Simon Rimmer being interviewed by Becky whilst we all tucked into some cake with a new cup of tea from Shanghai Pings. Simon was quite happy to sit and chat, and have his photo taken with bemused passers by! 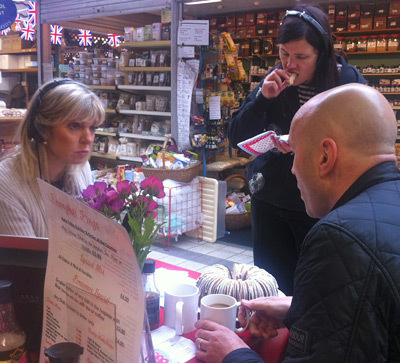 Simon Rimmer being interviewed by Becky Want from BBC Radio Manchester. 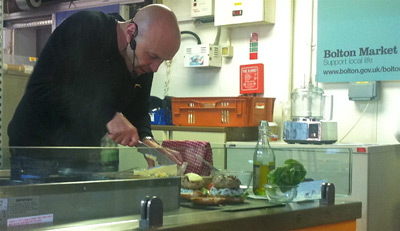 During the day Simon did three free cookery demonstrations from the kitchen in the market. At the one I went to he made some healthy 'street food' which was easy to recreate at home. He made turkey burgers with yogurt, tomato and bean salad, then duck meatballs with salsa and finally sea bass with patatas bravas. 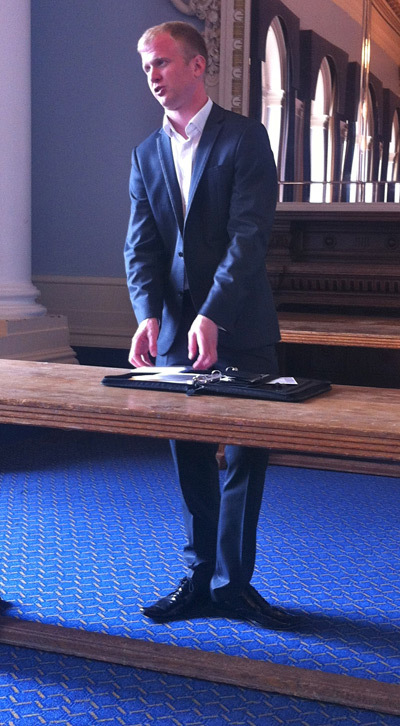 The Apprentice's Adam Corbally was running small workshops on how to start your own business. He gave a brief outline of how he had started his grocery business on his local market, his time on the Apprentice and gave advice for anyone wanting to start up their own business. His own inspiration was the urge to earn enough money to live his desired lifestyle. He knew that was never going to happen working for someone else. Adam showed a real tenacity when it comes to being successful, and it was clear that he has masses of enthusiasm for everything he does. Smiles make sales - be nice! When I got a bit of free time, I had a ganders at some of the brilliant market stalls. Some of these people had never even traded before! 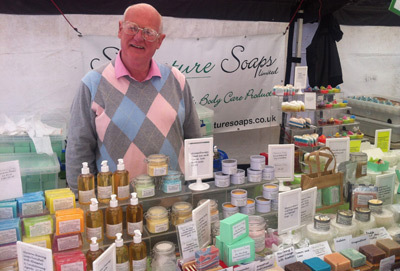 One person I spent a bit of time with was Brian from Signature Soaps. He's a real advocate for local markets and is a loyal attendee of the produce market. Two of my favourite stalls (because I'm a right greedy piglet) were Purdon's cheese stall and All You Knead. All You Knead had the most fabulous real ale bread. My husband is well into his ales at the moment, so I snaffled some toot sweet. I then bobbed next door to Purdon's for a big block of strong Snowdonia cheese. Match made in heaven. 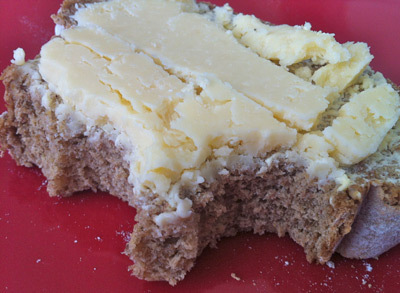 Strong cheese with soft, flavoursome bread. Hopefully both will be attending Horwich Summer Fete in July! I had some leftover cake at this point, so was happily giving it out to the traders! A while ago, a friend of a friend asked me to do some cupcakes for his son's birthday party. The brief was something suitable for boys. Turns out he actually fancied monsters! 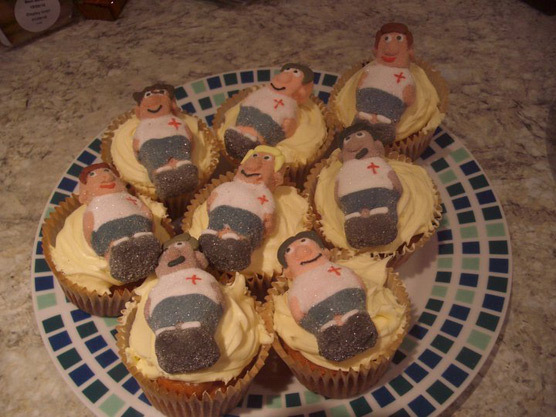 After making these, my friend Sarah saw the pictures and decided she wanted some custom made cakes for her son's confirmation party. His brief? Lots of different colours. There were going to be lots of children at the party, so she asked me to do a mixture of cakes suitable for girls and boys. So here we have it. Inspired only by a trip to the Mr Simms Sweet Shop in Bolton, and a few things I already had hidden in my box f tricks. No two cakes are exactly the same. I created these by making 24 plain vanilla cupcakes (use your favourite recipe) and two quantities of vanilla buttercream frosting. 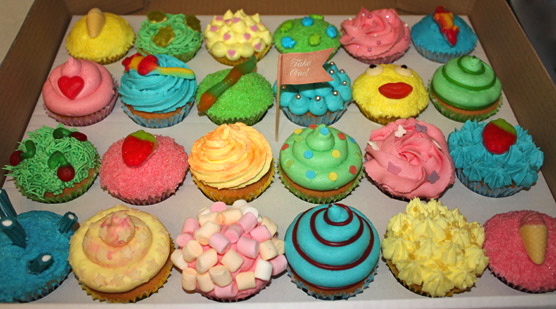 I then split the buttercream in four and dyed them different colours. I then used a variety of piping techniques using grass, rose, round and star piping nozzles. I also dipped some in bright sherbets. The sweets I bought included popping candy, laces, chewy sweets, cables, multicoloured rats (!) and chocolate shapes. We've watched the Great British Menu since day one. 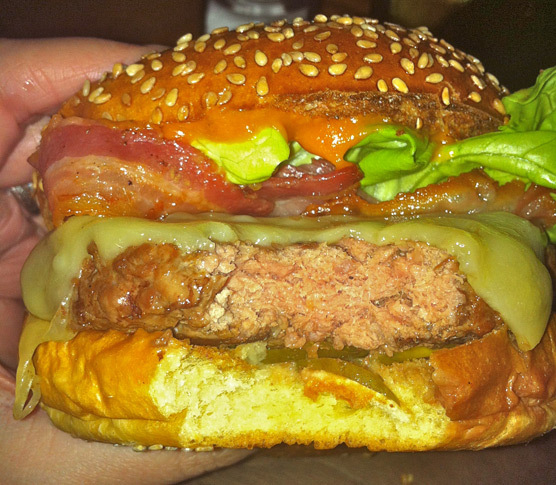 We cheered on our favourite chefs, and have sampled their 'Great British Menus' back in their restaurants. Can you imagine our excitement when one of our favourite chefs, Simon Rogan was to appear on the show? We are huge fans of L'Enclume, and hoped that he would bring something a little more exciting to the show. After winning the North West regional heat, Simon's dessert was picked for the banquet. We only had one option. We had to go and try this creation! So, my partner in crime, Mrs Petticoat (aka Vicki) booked us a table pronto. The Horwich Fine Dining Society were once again on tour. I hope you now understand the level of excitement we are talking about here? We were a little disappointed to hear that the Great British Menu was being served in L'Enclume's sister restaurant Rogan and Co. This also meant that we couldn't stay over in their rooms, and everywhere locally was booked up. So we booked a lunch reservation instead. Yesterday Vicki called to check our reservation, and was informed that there was nothing there, and nothing that could be done. After a trip to work to retrieve the confirmation email, only then were we given a guarantee of a table. A table we booked weeks ago. This wasn't a great start, but we tried not to let it dampen our spirits. On arriving at the restaurant, we were seated and menus were brought over. It was Father's Day, so a special menu was also available. Unfortunately, this is where our experience started to go rapidly downhill. Please understand that I am not in the business of writing scathing reviews, and always try to remain constructive. I will therefore give you the facts. We were left almost twenty minutes without a drinks order being taken, whilst other diners were seated and theirs taken immediately. No apologies were made when it was taken, and the manager proceded to take our food order soon after that. About ten minutes later, some canapes arrived. I have to say these were lovely, if not a little hot! We didn't quite catch what they were, other than that they contained eel and had a smoky taste. I really liked these! 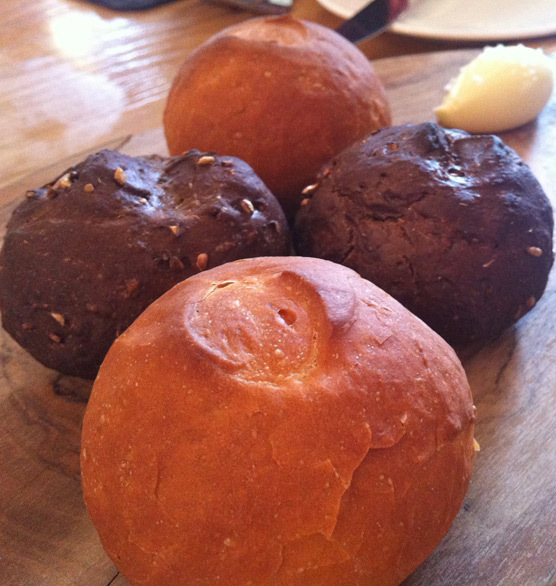 Then came some bread rolls. The bread itself was tasty, but we weren't actually told what flavours they were. One was clearly a crusty white roll, the other darker one had a treacly taste. These were a pleasant little filler as we were all starving! I was particularly excited about the starter, as it had been so well received by Marcus Wareing during the filming of the Great British Menu. It was a warm salad, which reminded me a little of the Satio Tempestas which we had at Frantzen/Lindeberg in March (which was phenomenal). I can only describe this dish as 'nice'. The leaves were crispy compared to the smooth custard and there were lots of little additions on the plate which added a certain something. However, having eaten at L'Enclume several times, this felt a bit like a watered down version of what Simon normally serves. It was the fish course next. I'm not a huge fan of fish, but this one was lobster which I love. When this came, we all looked at each other in disbelief. Where was the lobster? There were two tiny pieces hidden under some yellow beetroot. When I got home I Googled a picture of what the dish had looked like on the TV. This reaffirmed what we had all thought. This dish was considerably smaller, and part of mine was overcooked. 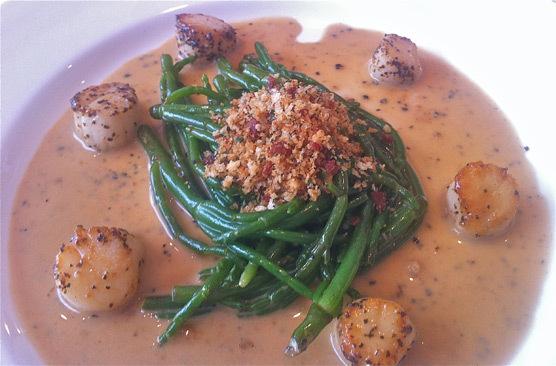 Below is an image from the BBC website of the same dish. Considerably more lobster is served with this dish. At this point the service slowed down considerably. Our waitress walked past our table several times, acknowledging that we still had plates in front of us and no drinks. In the end, we went and ordered drinks at the bar. It was nearly twenty minutes before our plates were removed. I would normally welcome a break before the main course, but we were all still ravenous! We had been eyeing up the roast beef going past us which was on the Father's Day menu, and were looking forward to the suckling pig main. When it arrived it was tiny. Our hearts sank! The piece of pork belly was only twice the size of the canapes we had when we arrived. I have to say that the pork itself was obviously of high quality and was rich in flavour. I liked this. I would have just preferred to have slightly more of it. This amount is fine when you are in the middle of a fifteen course tasting menu, but in this instance was just not substantial enough for a main course. After the main course, again we had a lengthy wait before our plates were removed and our desserts arrived. Unfortunately, this time we had no cutlery to eat it with. My husband asked at the bar and it arrived promptly. I enjoyed this dessert. The hazelnuts were made into a sweet brittle and the ice-cream was smooth and creamy. The pears were tangy and it worked well as a combination of flavours. After our meal, we all felt a little deflated. We had been really excited about going back to Cartmel for this special menu, and were about to leave feeling quite angry. I decided to speak to the manager in a quieter part of the restaurant. I explained that the portion sizes, the difference to what we had seen on the show and the poor service had meant that we had not had the greatest dining experience. He assured me that Simon had cooked the meals himself, and suggested that sometimes customers have high expectations because of what the judges say on the show. I explained that we were also judging today's food by the standards of previous meals at L'Enclume. He said he would feed this back to Simon. Although I appreciated the fact he was doing something with my feedback, I wanted some acknowledgement that front of house were just as much to blame. I really am a huge fan of Simon's, but I couldn't help but feel like this food was like seeing about 30% of what he is capable of. 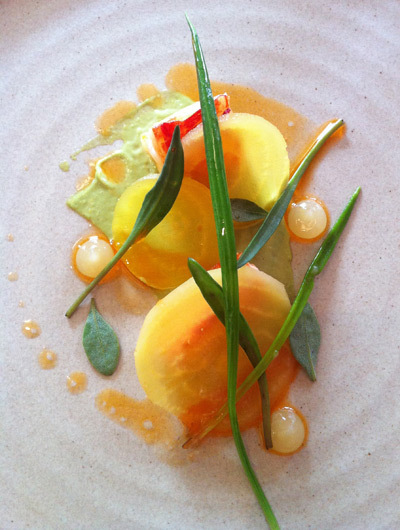 Likewise, we have had fantastic service in L'Enclume. 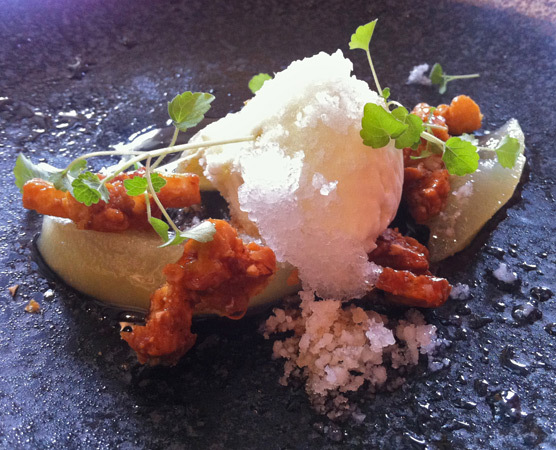 Please do not let my review of this one occasion put you off going to L'Enclume. We have had some fantastic experiences there and fully intend to go back. I think perhaps the concept of recreating the Great British Menu at Rogan and Co is flawed. I understand that there is a huge overhaul of menu and processes underway at Rogan and Co, so this may have contributed to the disjointed feel in the dining room. 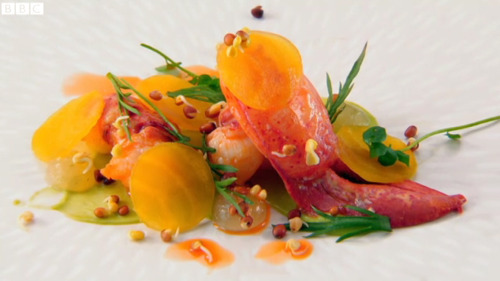 The Great British Menu cost £59 per head for four courses. We did receive a discount based on our feedback.